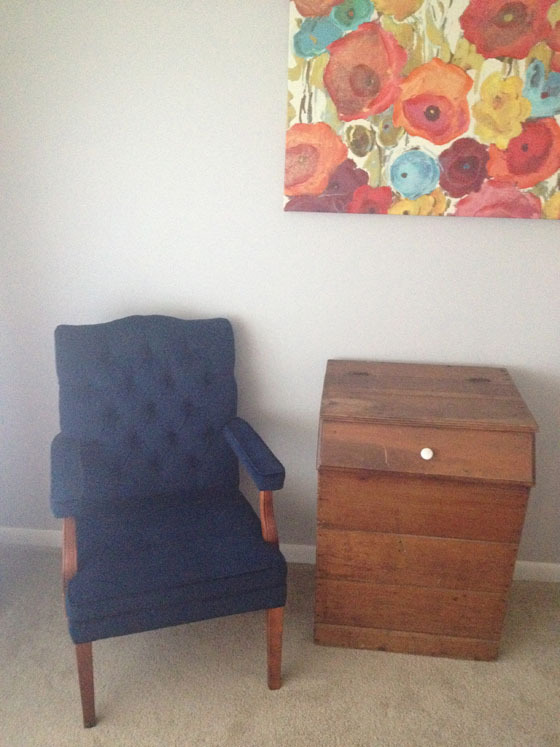 I bought an old grain bin this spring that’s been moved from wall to wall until it found its home in my dining room. 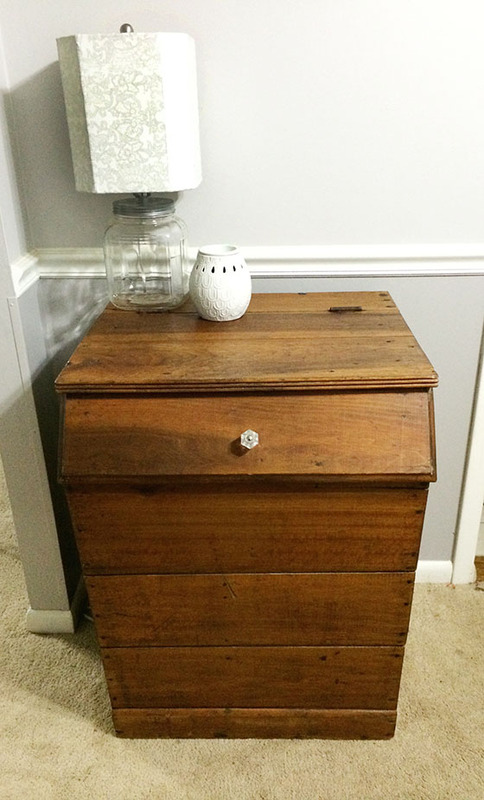 It’s lived in the dining room for months now, in its grungy, dirty state until I got tired of the grime and fixed it up this weekend. You can see in this photo below the grain bin in its original state on the day I brought it home. 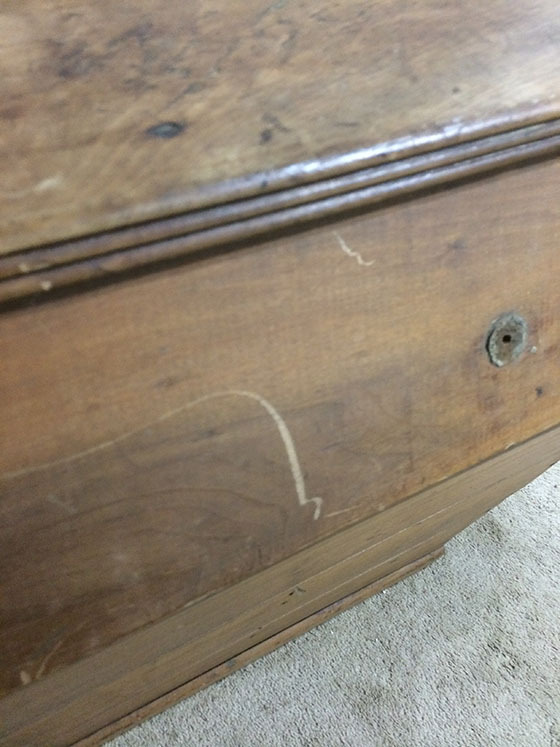 It had a white knob and was all scratched up. I took off the white knob, which was only drilled partially into the front of the grain bin. 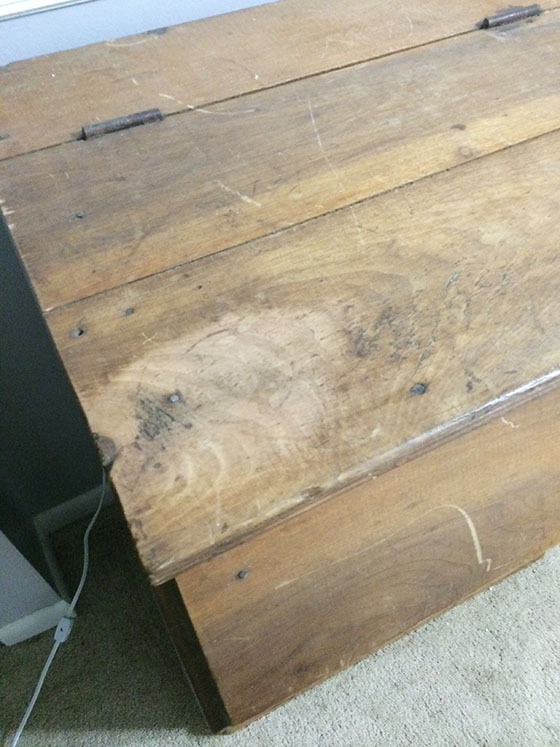 It was a pain in the bttt to remove, but I needed to do that before I could clean around it — it was oddly grimy. Yuck. I took a few more photos of the piece before getting started on the refinishing. Here’s the beat up top — probably the worst part of the grain bin. The front panel of the top of the bin was super scratched, too. Since the wood was in super rough face and didn’t look like it ever had much of a stain on it, I was doubtful that my go-to Restor-A-Finish would work. 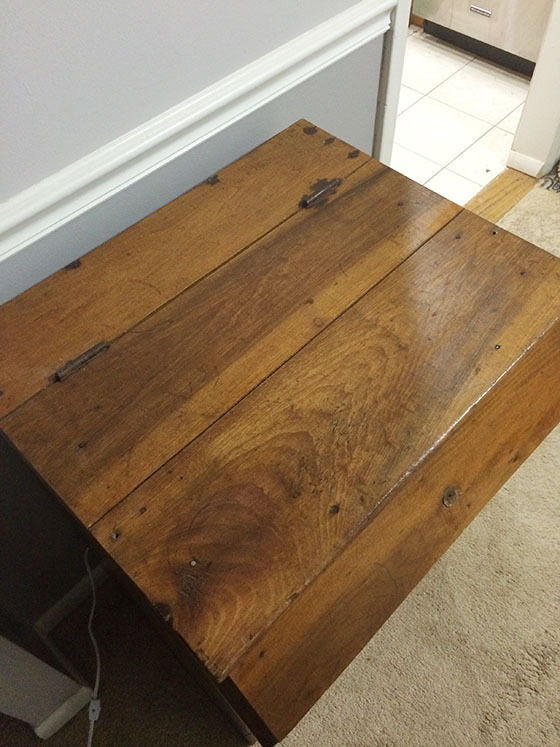 But lo and behold, this might be the best use of the refinishing product yet. 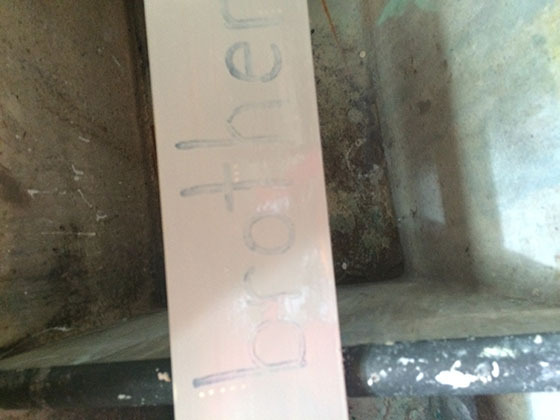 To use Restor-A-Finish, simply dab it on a paper towel and rub it on your piece. Let is sit for 20 minutes, then wipe any excess off. The grain bin was thirstyyyyy, so there wasn’t too much of the finish to wipe off. 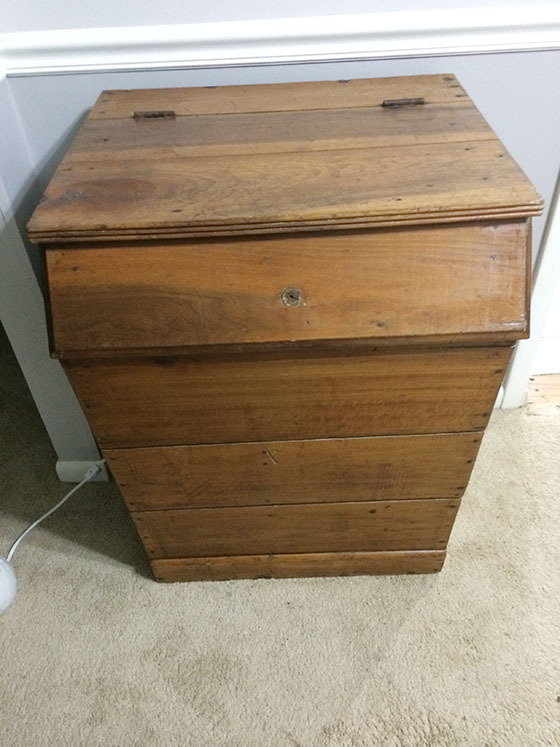 Notice any of the scratches or discoloration before? And hello beautiful, shiny top. I mean, seriously, can you believe the difference? All I needed to do at this point was add a knob back on the front. 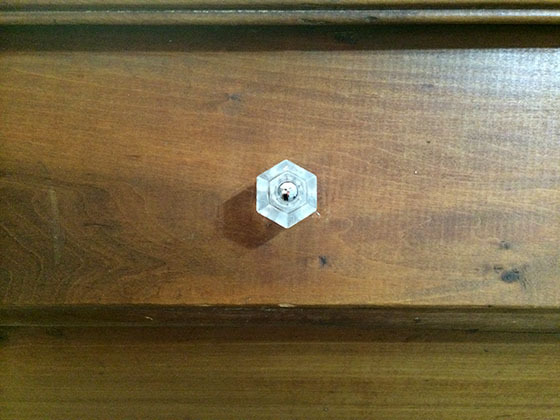 I grabbed my drill to make a hole through the front panel, then attached an antique0looking crystal knob. 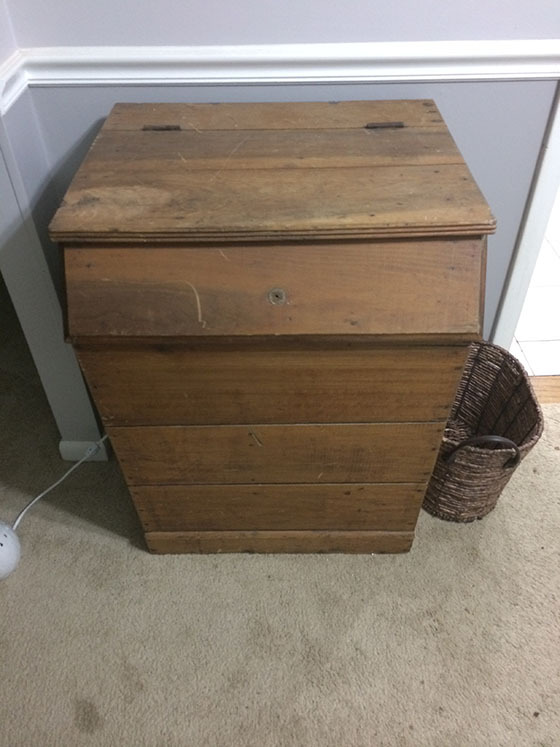 I bought the grain bin on a whim — basically I just had to buy something at the Barn Sale I went to back in April. Now that it is freshened up, I love this impulse buy and think it totally belongs. It acts as such a nice mini-buffet in the dining room. We usually have our fruit bowl here, but my three apples looked sad and lonely. Did I mention we store all of our outdoor equipment in it? Volleyballs, badminton racquets…. all sorts of fun stuff. What… don’t you store that sorta thing in your dining room? 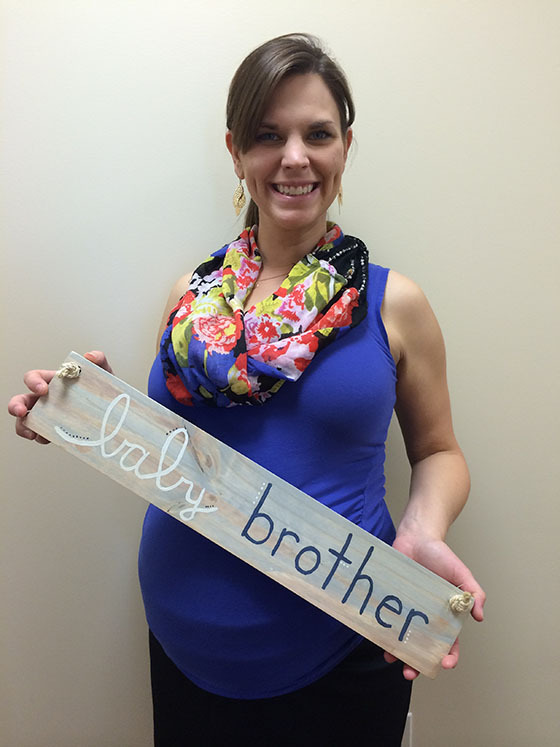 My good friend Carrie is expecting her second son in September and I am so excited for her and family. This baby has been dubbed “baby brother” throughout her pregnancy (her last baby was nicknamed “Kermie”) and she jokes that it should be his actual name. 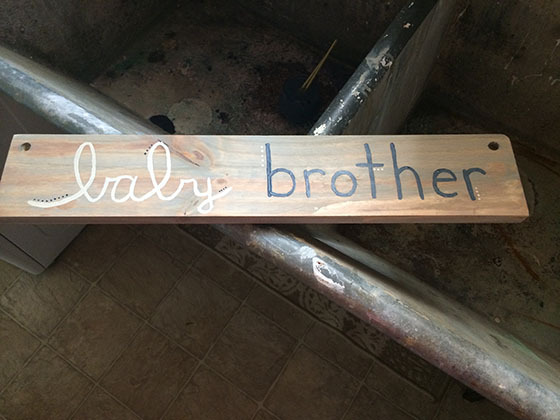 Using scrap wood from my console table project, I made her a sign for her little one’s nursery using the nickname. 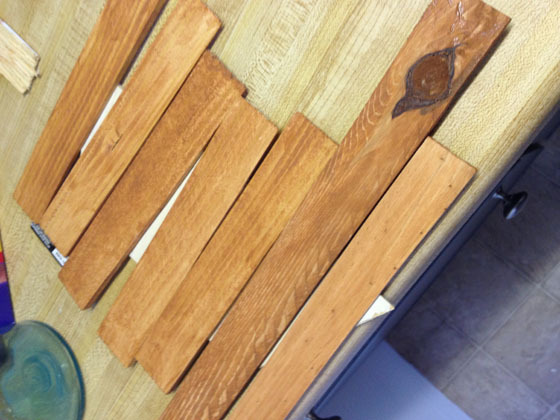 I pulled out a piece of wood that actually broke off where it was laminated/glued together to the other boards. (Hopefully that doesn’t happen to the larger sheets of wood I used for the tables). I sketched out “baby brother” and then immediately sanded it off because I didn’t like it. I opted to freehand paint it instead. I did “baby” in off-white and cursive. 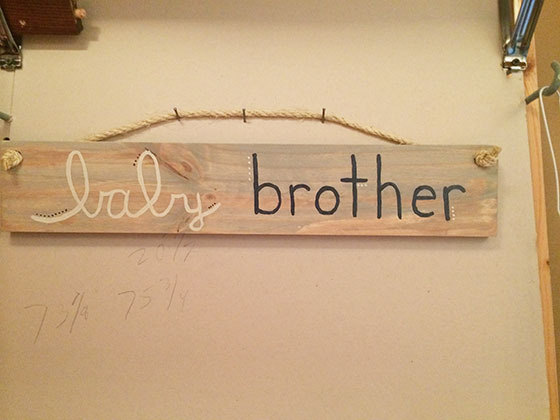 Then, I painted “brother” in navy and a print handwriting. I added a few dots of the opposite color to each word as a cute little accent. 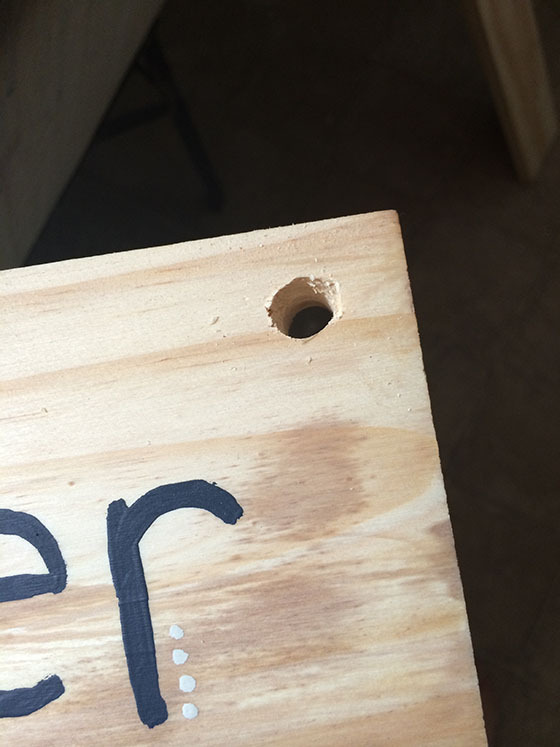 Then, I drilled holes in the top two corners large enough to string rope through. Before adding the rope, I stained the board with a light weathered gray stain. This really helped the off-white paint pop. I put the rope through each hole and knotted it so it wouldn’t pull back through, then hung the sign up to dry. Since it will just be hanging on a wall, I didn’t bother with poly. I gave her the sign on Thursday and she loved it! Last year, err 2012, my dad and I did a craft on Christmas Eve. It was one of the highlights of my Christmas break and I was looking forward to doing one again this holiday season. 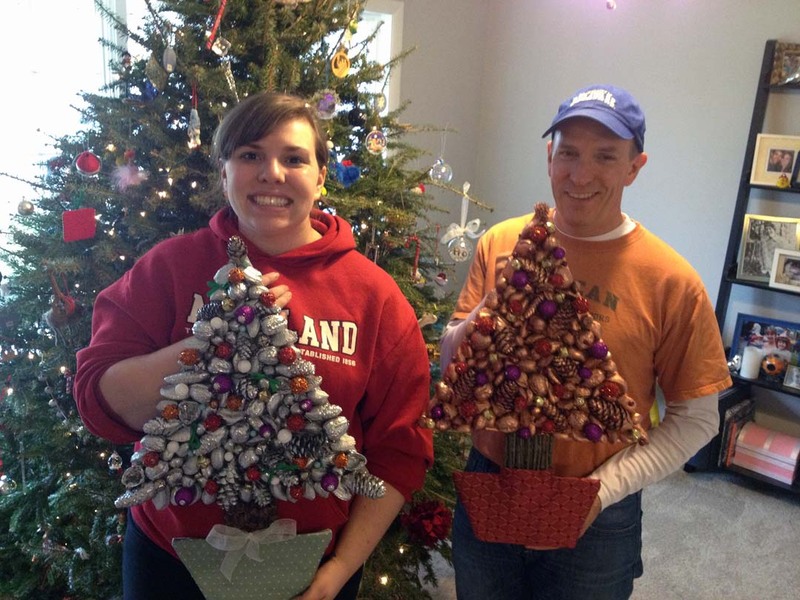 My family loves traditions, and when you do something awesome, why not do it every year?! Well, turns out my dad scheduled carpal tunnel surgery the Thursday before Christmas Eve. ON BOTH HANDS! He is crazy, and tough, and did I mention crazy? If I had asked him to Christmas craft with me on Christmas Eve, he probably would have said yes. So I didn’t ask. Sometimes the kid has to play parent. Instead, I set out to make a craft as a final Christmas gift for him. 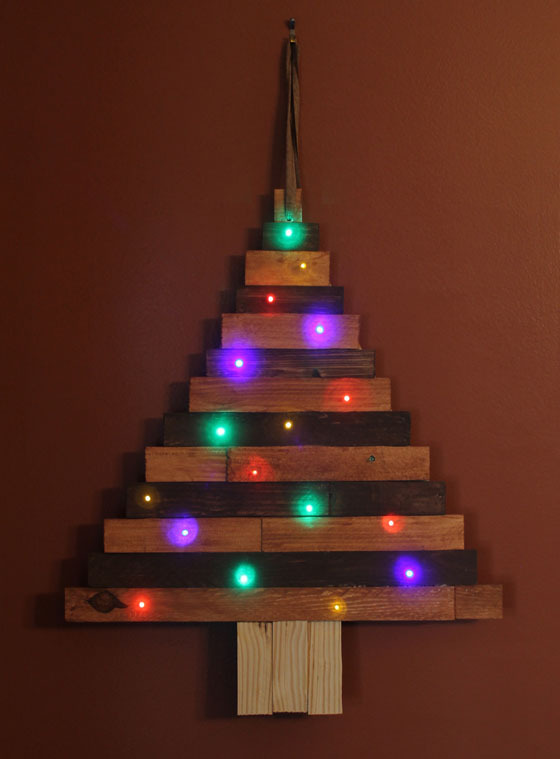 When we made our Christmas Tree craft in 2012, we cut out one extra base for this year — we had grand plans to make a light up tree! With the base already cut, I got out my supplies for my craft: shims, paint sticks, Minwax stain cloths, wood glue and battery operated lights. 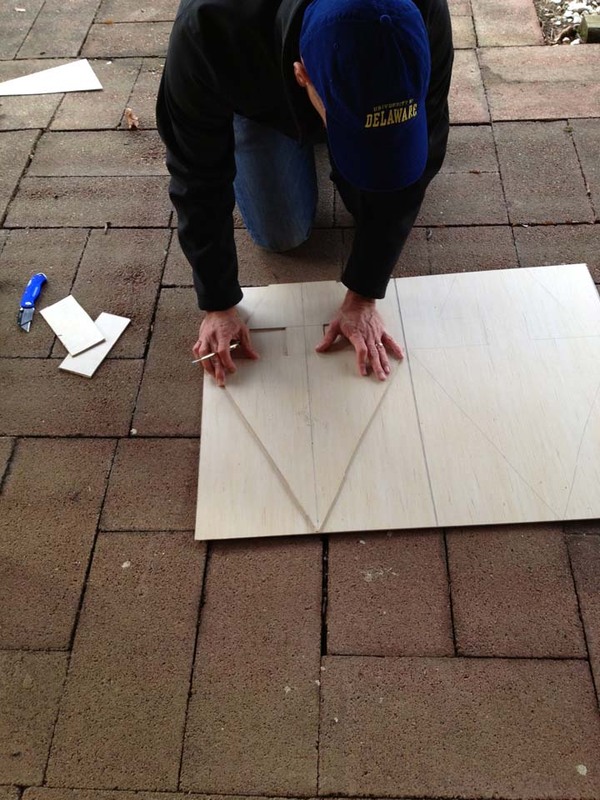 First, I cut off the “tree stand” from the tree we created last year. Basically, I trimmed down the tree so it was a triangle with an itty bitty rectangle stump. 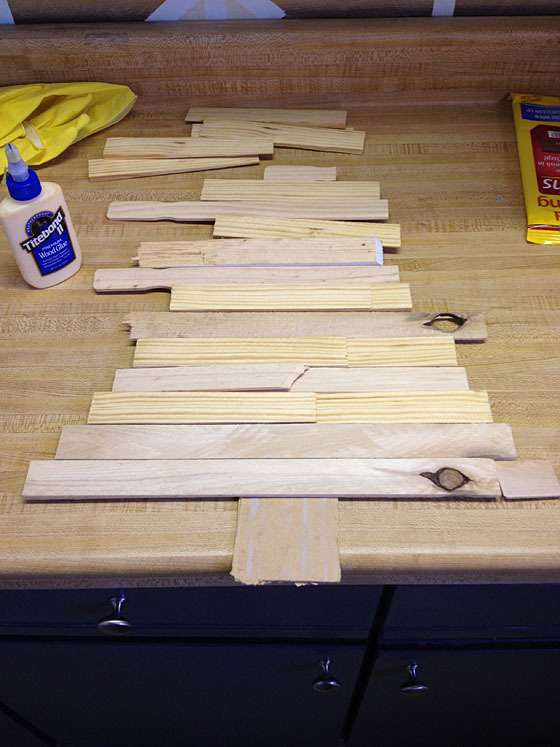 Then, I lined my shims and paint sticks in rows to see how many I had and if I wanted to cut any down to size. I definitely had a few to trim and sand, but first I got to staining. Speaking of stain, I was fortunate to receive a few Minwax goodies before the holidays. One of the goodies I got was a new product I hadn’t heard about. 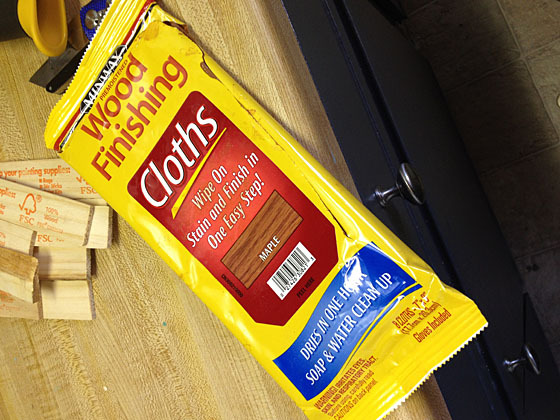 Minwax now makes stain cloth wipes! They look kinda gross (OK, really gross), but they are awesome. 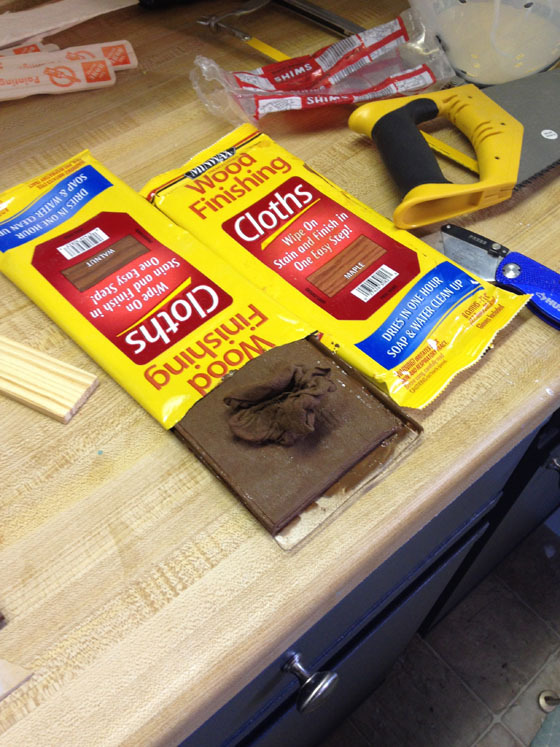 I let the stained shims dry for about an hour before moving on with the project. Dry stain meant time to get moving. I was doing all of this on Christmas Eve after all. 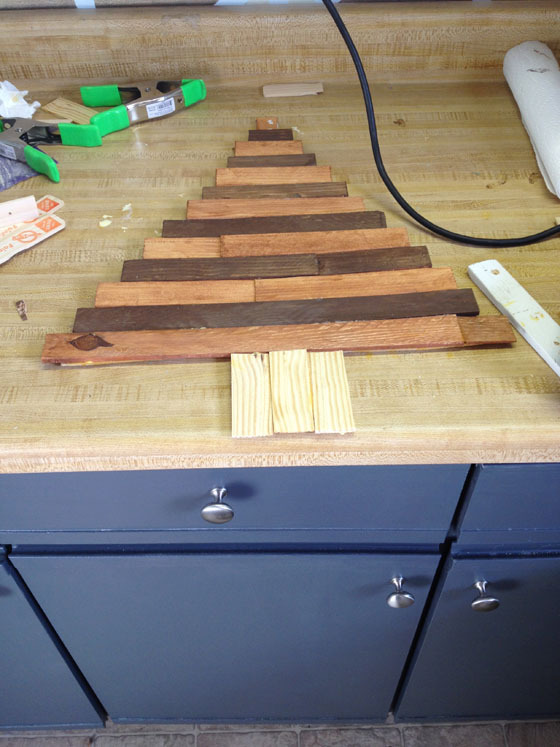 I used wood glue to adhere the shims to the tree base (after trimming down a few here and there with a hand saw). 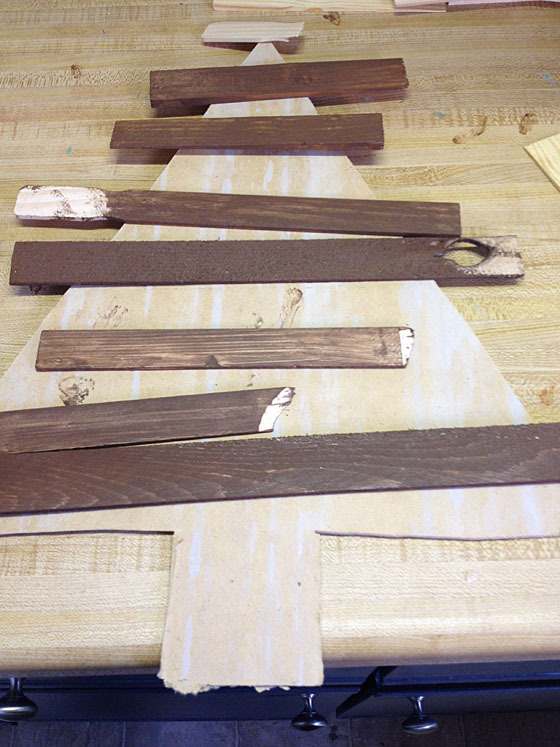 When all of the shims and paint sticks were in place, I smushed the entire tree under a heavy bin to put pressure on the shims to help them stay in place. With the three dried and holding up well, I moved onto the lights. I bought battery-operated LED lights from Target. The strand had 18 itty bitty lights on it, so 18 itty bitty holes I drilled. I taped all of the wired down against the back of the tree and added the battery pack to the back with velcro command strips. 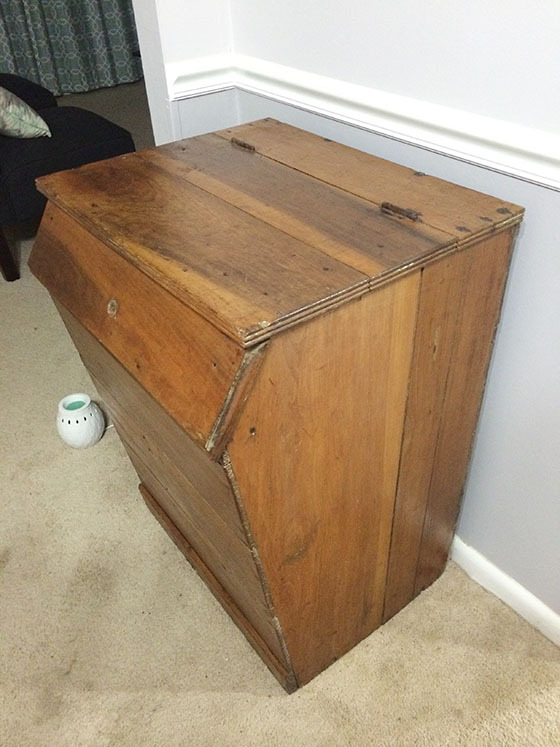 Last, I drilled a hole in the top and wove a ribbon through the top. Unfortunately, this next picture doesn’t do the tree justice. But in the hustle and bustle of the holiday, I didn’t really care to get the perfect picture. Forgive me? All that really matters is that my dad loved the tree. He hung it up immediately 🙂 In 2014, we are definitely crafting together though. That was just better, even if my tree is pretty darn cool. Did I mention the lights twinkle, too? Light-up tree? Mission accomplished!